Mini-Comics Day is tomorrow (April 9th)! 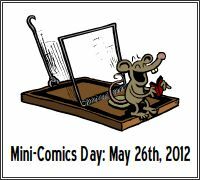 On Mini-Comics Day, participating cartoonists from around the world will write, draw, and print copies of a mini-comic, completing the entire process from start to finish in a day or less. Anyone in the world can participate.